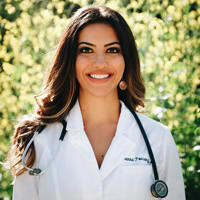 Dr. Aunna Pourang is a graduate of the University of Florida College of Medicine Medical Honors Program and is board-certified in family physician (Mayo Clinic) and integrative medicine (Academy of Integrative Health and Medicine). Dr. Pourang is currently a research scholar in the Department of Dermatology at the University of California- Davis with a research focus on the gut-skin axis and microbiome. Her other interests include integrative dermatology, global and preventive health, and antibiotic-stewardship.